Lemonhead Candy Prize Pack Giveaway! Fine Print: I was given a prize pack for review and Ferrara is giving a prize pack to a winner. All opinions and statements below are my own. Did you know that there are more to Lemonheads than the yellow ball of sour deliciousness with the hard candy center? I didn’t know there there was, but there’s a LOT more! After more than a century, Ferrara still believes it is a treat to introduce beloved candy brands to new generations of candy fans and because of that, here’s what’s new with the world famous Lemonhead. Without question, Lemonhead is the most iconic sweet and sour candy brand known and loved ever since it first started tantalizing taste buds over 50 years ago (1962 to be exact). This year, the brand (packaging and logo) not only received a fresher, updated look, Lemonhead also welcomes a new product into the family with the debut of Lemonhead Gummies. I recently got the opportunity to try all of the varieties in the Lemonhead family and my kids were ecstatic. This package included the original Lemonheads as well as apple, cherry, grape and more! They come in the original hard candy, chewy candy and now gummies. Yes, clearly, Lemonheads are attempting to take over the chewy candy world and I’m pretty okay with that. I am a huge fan of the original Lemonheads. I like the chewy outside and the crunchy center. They are a staple of my childhood and I have always enjoyed them. My kids were far more interested in the gummies and the chewy candy. The Tropical Chewy Candy (especially) is completely different from anything I would have expected from Lemonheads, but super enjoyable! With flavors like kiwi-strawberry and peach-mango, every bite is a little bit of a surprise. We sat together popping a new flavor into our mouths going, “Hmm… I like this one! Everyone try it!” and passing them around. Before my husband absconded with the gummies, we got to try a few of those as well. They are a firm gummy (which I prefer – not mushy) and flavorful. If you haven’t tried anything other than the original Lemonheads, give the others a chance! There are fun flavors and varieties that you likely haven’t heard of before now. I stole the little boxes of Appleheads and Grapeheads to keep in my purse and car so don’t tell anyone in my family! Those are my favorite flavors and I’m not sharing! 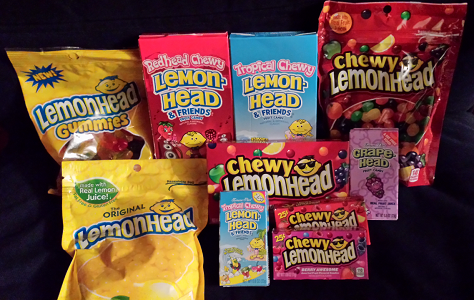 To get everyone excited about these new varieties of candy, I am giving one lucky winner a Lemonheads Candy Prize Pack! To enter this giveaway, complete any or all of the options listed below. Giveaway ends 9/19. Good luck! The gummies…had no idea those existed! I would like to try the Tropical Chewy Lemonheads. The Chewy Lemonheads look good! Thanks! I would love to try the Tropical Chewy Lemonheads. I never knew the chewy or gummie ones existed. How neat! I would love to try the Lemonhead Gummies. I’d most like to try the chewy candy. I want to try the Cherry Lemonheads! I want the gummies. Never knew about them. I would love to try the grapehead and the tropical chewy lemonheads. I have not tried any of them before. The ones that say chewy on them sounds great. I would love to try all of them. I love sweet things. kiwi-strawberry sounds like a tasty flavor to try. My kids would love all of them but probably the gummies. I would love to try the gummies! The gummies would be great! I’d like to try the Lemonheads Gummies. Cherry lemon heads sounds good!! the gummies! Who knew about those? not me! I would like to try out the Cherry Heads. I would like to try the Chewy Lemonheads. I would like to try the tropical chewy flavor. Id like to try the grape or apple flavor. I’d like to try the gummies. I’d liketo try the Cherry Heads! I’d like to try the original lemonheads… I love lemon anything. They all sound good! I’d like to try the tropical chews. I bet I’d love the chewy lemonheads! I’d like to try applehead. I really want to try the lemon head gummies! !